else to do. He is only 13 and going through puberity. He does have something that we thought was psoriosis on his head, but doctor says it is just try scalp and maybe not rinsing his hair properly. So I am not sure if this is connected. I am concerned that it might be POTS which effects the feet. We do have an appointment on Wednesday to see our family doctor again and this time we are hoping that he can see a dermitologist. Any info on what this could possibly be would be great. If your son were having a reaction to chemicals in his shoes and slipper then more than likely it would be affecting more than just his toes, so I do not think that is the problem. This appears to be a circulation problem to me, or at least that is the thing that needs to be ruled out. Have you noticed this problem in primarily cold weather? 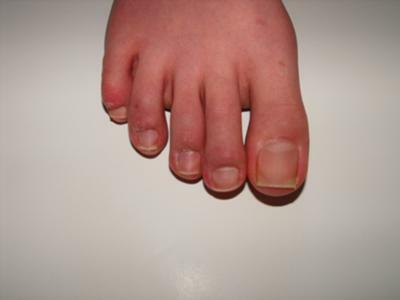 If that is the case then more than likely this is what we call a vasospastic disorder which means the cold weather clamps down the arteries in his toes, diminishing the circulation and thus causing color changes in the toes. If he had the problem during the summer months then it probably would not be the cause. In general it comes with cold damp weather, will last the season, then once the weather begins to warm up the toes return to their normal appearance, only to recur once the weather gets cold. Ask your doctor to investigate the possibility of a vasospastic disorder. This would be considered by many to be a superficial frost bite.